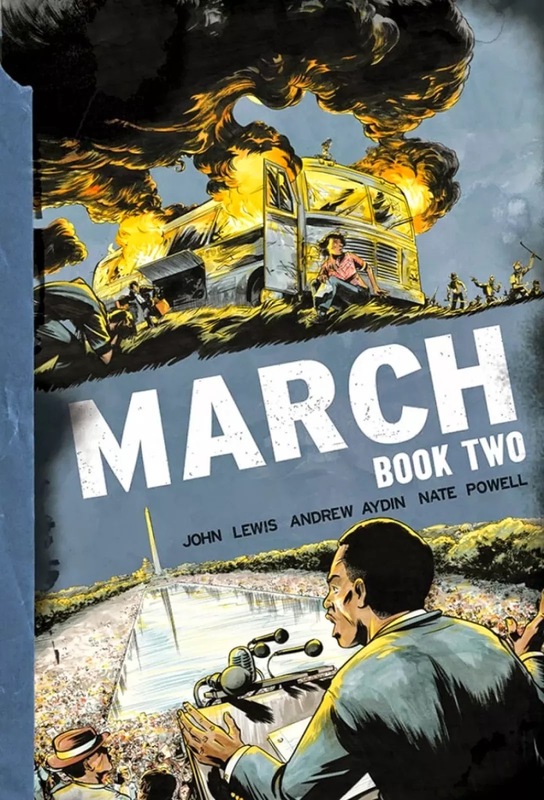 Last year, Congressman John Lewis' graphic novel March came out to much critical acclaim. It was the first part of his biography that only covered the first twenty years of his life. Book Two was released yesterday, picking up where the first book left off, but covering only the next three years. Of course, 1960-1963 were very turbulent years for the civil rights movement. Sit-ins in restaurants and stand-ins at theaters were still ongoing, the Freedom Rides took place in 1961, and the march on Washington which culminated in Dr. Martin Luther King, Jr.'s famous "I Have a Dream" speech happened in 1963. And Lewis was very directly a part of all of that. Consequently, all of that is covered in Book Two with the Freedom Rides themselves taking up over half the pages. What was striking to me was the excellent use of the comic medium here. Lewis' story is indeed a powerful one in and of itself, but artist Nate Powell does an excellent job illustrating key moments that really bring the story home emotionally. The imagery that simply was not possible to capture at the time -- notably many of the beatings and phsyical confrontations both in and out of prison walls -- is on display to hammer home the truely graphic nature of what Lewis and his peers endured. The book is not gory by any means, but Powell doesn't hesitate to show just how horribly Blacks were being treated. The non-violent methods the Freedom Riders used compared to the incredibly violent methods used by the racists they encountered is very much on display throughout the book. You may have seen some photos of the burning bus, or various Riders with bandages covering their wounds, but seeing the actual moments of impact -- perhaps one of the strongest elements of comic art -- makes the story that much more powerful than had it been prose or film. The historical story is couched against the inauguration of President Barack Obama. Snippets of that event are peppered throughout the book, as an ongoing reminder that the civil rights movement was worth fighting for. Included here is Aretha Franklin's singing of "My Country 'Tis of Thee." In the book, Franklin is depicted exactly once. In her hat. It's an absolutely inconsequential part of the overall story, but I bring it up because Franklin's hat -- possibly one of the most visual remembrances people have of that particular inauguration -- is incredibly understated in Powell's illustration. Which suggests (to me, at least) that all the horrific things I alluded to in the previous paragraph were also understated. The most powerful graphic elements of the story -- the parts that really hit emotionally in ways that no documentary I've seen have ever been able to do -- those graphic elements don't even begin to describe the horrors that Lewis faced. Regardless of how much you've seen/read about the civil rights era, and especially if that isn't very much, March, Book Two should absolutely be on your must-read list. Everyone knew this was going to be a powerful story going into it, but they delivered in spades and took good advantage of the comic medium.